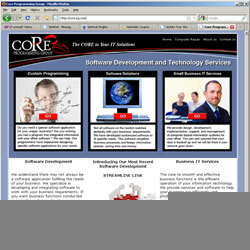 Project Scope: CORE PG provides fast, reliable technical assistance and solutions for Hardware and Software to local business, small offices and home computer users. Graphic Editors Adobe Photoshop, Illustrator and Flash. The site has a "Matrix" style flash header represenetative of binary code.